One of the most popular requests regarding control options is a dedicated Morph/Un-Morph button. I found myself having trouble double tapping down when I tested analog sticks, and since I already added Prime-Style control options (Spiderball), it was a matter of time until the Morph button was implemented. The button is configured at the options screen, and it coexists with the classic double tap morphing. There is now an option to disable the classic Morphball activation, so people who use analog controls won't un-morph by accident. That single button introduced a pretty significant amount of bugs... well, it exposed some of the older code that worked around even older issues. After many test builds the engine is stable and more flexible than ever. There are other control features being worked on, those will be announced as soon as they are stable, polished, and confirmed to be in the engine. Regarding the progress report, some people asked me about the "Steam Community Compatibility" Item. The game won't be released on Steam, nor it's on GreenLight. If you manually add AM2R to your Steam game list, you can launch it from there, and the Steam Overlay will be visible from inside the game. Right now the display is incorrect, and I did a bit of research on some options to get it working. But it will take a lot of trial and error, and it's not a primary feature. As always, if you want to suggest features or improvements, you can share your thoughts here or at the Forums. It'll be fun to play a hybrid of the two control schemes, too. We're cheering you on from the sidelines, Doc! I love the work you've been doing Doc, keep it up! :) With regards to the control schemes though, could you please add an option to use the d-pad on the controller? Its just not as fun/good with an analog stick in my opinion. Not sure who plays 2D sidescrolling Platformers with an analog stick. but whatever. If they find it easier that is their own choice. Glad to see progress. Dude. Just keep advancing forward. I cant wait to play the game. The Demo was amazing. But what controllers are compatible so far? Come on people, Steam? 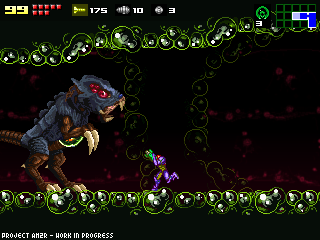 This game just running in my PC will probably be the most awesome thing since Super Metroid running in a SNES. Hey Doc, please, focus on what is important: just make the game. Other stupid details can be done after the full release. I wish Nintendo would get a hold of you and let you release it on the 3ds and wiiu. Maybe you could focus on actually finishing the game, and having a working release before you focus on compatibility with controllers and steam. My Keyboard and my computer screen will run this game just fine. Thank you so much for doing this sir, you have given so many Metroid fans something to look forward too while there are currently no Metroid games in production. Any ideas at this point on when it might be completely finished? You have all our full support sir, thank you again and god speed! i agree with the d-pad comment it just doesnt seem to work so well with analog sticks. I've been using the ol' SNES controller with a USB converter that I got from the Bay for cheap cheap and it is perfect for AM2R! Catching a bit of the zzz effect here. I think we need an exciting update, or better yet, a release! Please keep up the amazing work. What you're doing is a thing of beauty. Any target date for a full game release? I just played through the demo today, and it was absolutely phenominal! Only problem I had was that when I obtained the wave beam, it seemed that my rate of fire decreased slightly (not sure if this is on purpose or not). Keep up the fantastic work! Saludos bro espero estés bien que buen progreso eso de la spiderball me paso hace tiempo no tenia idea que lo estabas arreglando, detalles como esos hacen mucho mejor el juego que son opcionales pero le dan ese toque fantastico! ya nos veremos en otro informe! saludos! Again, AWESOME work... :) Keep it up!! so you know, ive been watching your posts and the vids since 2008. ive played all the demos, and i have to say, you dont need to change a thing. the game your making is incredible. i still have the original gb cartridge and ive fully completed it more times than i can count. youre doing an amazing service to diehard metroid fans everywhere. keep up the good work. were all cheering for you. found a small bug in the 1.21 demo. in the second breeding grounds, an alpha used the rush attack, missed, and went back to its normal attack routine, but the animation was it turning round and round in circles continuously, as if it were detecting samus simultaneously on both sides and not knowing which way to go. it didnt cause a crash but it did make it a bit harder to kill as it was constantly turning, so i had to hit it almost directly underneath. just wanted to let you know. Hey,I think there is a way to publish your game on the E store or steam will you do that? This game look so good! so that we can play the game as soon as possible, im not trying to be a jerk or rush you but i would rather the game be done in a couple months than the game be out in a year with tons of control options and mods. This project is very nice. I have played most of the original GB Metroid II. A nice feature would be a 2x clean stretch option under Display. It gets kinda blurry when you stretch it making it larger. A page displaying All available controls. I've been using Joy 2 Key and a Snes pad to test the demo. Are there supposed to be sound effects in the Demo? Or, is my sound settings on my comp just wrong. It didn't detect any sound device. Chow and keep up the nice work. I've just finished the new demo. INCREDIBLE!!! DoctorM64, why don't you open a page on Facebook for Metroid 2 Remake? I bet many people would like that page. wheres the update doc...im sure i speak for many when i say....WHATS GOING ON!!!!! Dude, this project is seriously awesome! Excellent job! After you finish the game, though, I was wondering something: Would there be any way for us to upload the game onto an actual GBA cartridge? I'm not asking you to do that (you got enough on your plate), I just wanna know if it'd even be possible and if so, how would it be done? Regardless, great job on the game! Focus on finishing it! Doc, where's the update? We're scared! I've beaten demo 5 times on hard difficulty already! >Would there be any way for us to upload the game onto an actual GBA cartridge? Of course! Just attach an x86-compatible CPU and install Windows on your GBA, and that's it! Ah! I check this site every day waiting for an update! It's like.. the highlight of my month (sad!). I just finished Metroid 2 on my 3DS virtual console and I so want to play past the end of the demo!